The Douglasville Eye Clinic Optical Shop provides comprehensive optical services including a complete spectrum of several hundred modern frames and sunglasses. We offer the highest quality single vision, bifocals, progressive (no line) bifocals and computer/ reading lenses. We also provide the state of the art optical lens design and features such as anti-reflective, UV lenses, Transitions lenses (which darken in sunlight), polycarbonate lenses (safer for children) and high index (thinner/lighter) lenses. We do accept most vision plans and are quite cost competitive with local retail shops. All of our new frames are guaranteed for one full year against breakage, with no service fees or co-pays. Our patients keep coming back not only because of the quality of our products, but also because of our service and experience. Our business hours are Monday through Friday, 8:30-5:00pm. Ginger has been with Douglasville Eye Clinic since June of 2016. She brings over 10 years of optical experience and customer service to the practice. She has experience in contact lens fittings, repairs, adjustments and frame selections. She loves helping people find glasses that help them express their personality and boost their confidence. Shenna has been with Douglasville Eye Clinic since October 2017. 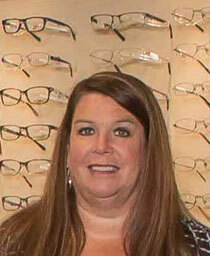 Shenna received her Associate Degree in Opticianry from Ogeechee Technical College in 2005. 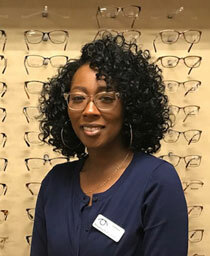 She is a licensed Optician in the state of Georgia and has current certifications from the American Board of Opticianry (ABO) and the National Conatct Lens Examiners (NCLE). She has been working in the field of Opticianry since 2008 and has experience with frame selection, fitting contact lenses, repairs, and adjustments. She enjoys helping patients with all their optical needs.